Yet another in-the-wings foldable thrown into the smartphone ring: this one from Xiaomi. This one has won considerable attention. Foldables-inundated tech watchers who saw it the concept via video said it looked "incredible," "unique," "amazing." What's the big deal? Think wings, actually. Two of them. Then think paper pamphlets that fold out in threes. When you hear the word "foldable" you are most likely picturing a phone that folds in two. The phone in this instance uses a tri-fold design, said Brandon Hill in HotHardware—yes, the prototype folds in three. 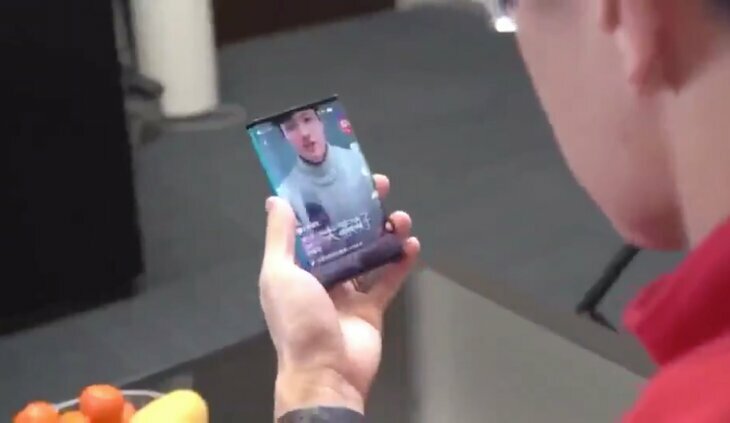 In a video, Xioami chief Bin Lin first picked up a very so-what-looking rectangular, single-screen device. "But then Lin turns the device into landscape mode and folds the two outer "wings" of the display under the larger middle portion," said Hill. The wings turn off when folded. Display there is gone. As shown in the video, the form factor changed on foldings. First you saw a device that looked like a tablet form factor but, once folded, looked like a compact phone. It's dubbed by the company as "double folding phone." So what do we call it? No, literally, what do we call it? According to the Daily Mail, the president Lin Bin said the device remained unnamed. Lin Bin was asking people for suggestions. Hill said internal favorites were Xiaomi Dual Flex and Xiaomi MIX Flex. Adnan Farooqui in Ubergizmo said it remained "unclear" when the company will provide more information, although "Xiaomi will be present at the Mobile World Congress 2019 in Barcelona next month so it's possible that we might hear something about it then." Tom Warren in The Verge said the same. "Xiaomi hasn't revealed when we'll learn more details about its foldable phone, but given Mobile World Congress starts in a month we're likely to hear a lot more about foldable devices very soon." Twitter reactions at the time of this writing were largely fit for the "take my money now" file cabinet but there were also reactions like "why do I need this." Foldables are becoming quite a popular topic as vendors scramble for fresh sales in the smartphone marketplace. In the bigger picture, one might ask, like the Twitter doubters, is the foldable phone to become a fad amongst gadget hounds who just want something, anything, to gain attention on the train ride home? The Guardian explored the question back in December. Samuel Gibbs turned to Ben Wood, chief of research at CCS Insight, for answers. "Although a magnet for gadget lovers, the folding phone's inevitable high cost and its trade-offs in usability will result in limited shipments. Problems are likely to include poor readability in sunlight, a bulky design to protect the screen's fold and the need for an external screen," said Wood in his predictions. Interestingly, the BBC News talked to CCS Insight's Wood recently and the latter commented on this Xiamoi foldable. "It is hard to judge the relative benefits of this versus a single fold and it will depend considerably on the user interface that Xiaomi chooses to adopt as it opens the ability to have a three-quarter screen option," Wood said. Nonetheless, Brace yourselves. BBC's Leo Kelion on Wednesday: "Weibo shows that the video has already been played nearly 3.5 million times and attracted thousands of comments since it was uploaded on Wednesday.